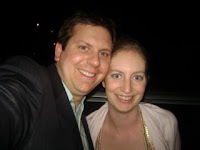 I've been working on a new venture (explains my absence) and, because of it, I'm moving blogs! Come visit me in my new home, won't you? I explain it all over there and I have a CONTEST to celebrate! Don't forget to add my new blog to your rss reader. I don't want you to be left out! Blogger, you've been alright but I'm outta here! Merry Christmas to all of you! I hope you had a fabulous day. We stayed home and it was so nice. I got some fabulous knitting-related gifts that I'll share with you later but for now, I want to show off my Christmas knitting. I finished my BPT earlier this months and it has been a most wonderful Christmas sweater. I opted to forgo the hood and I'm really happy with it. I used just about 5 skeins of Cascade 220. I didn't do the i-cord edging either. 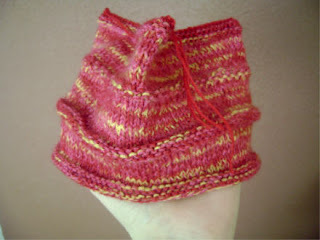 Instead, I did 2x1 ribbing, so it isn't very obvious ribbing. I liked the neat edge that the i-cord gives but didn't want to deal with trying to get it not to roll. I also changed the sleeves a little by not decreasing as much. I did 10 decrease rows instead of the 13 (I think) the pattern called for. I did one sleeve with the specified decreases and it was way too tight at the wrist. I also lengthened the sleeves and body just a little. 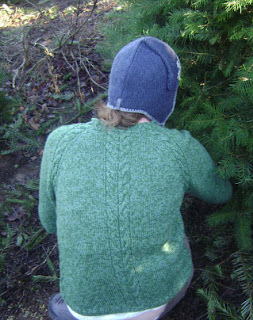 Here I am cutting down my Christmas tree, being careful not to get any sap on the sweater! 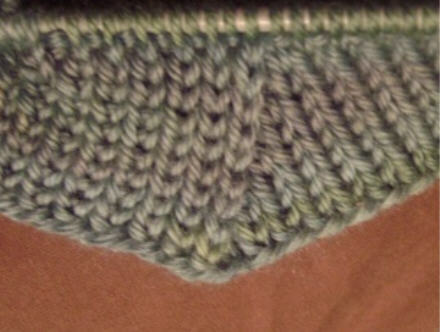 For the collar, I just picked up stitches did 2x1 ribbing as well and continued the cables to the edge. have I said that I love this sweater? I also have been furiously knitting a stocking for the babe. I really wanted her to have one this year, even though she wouldn't know the difference.This is me knitting furiously at about 2 in the afternoon today. I wouldn't let Mike open his stocking until she had hers all done so I was under some pressure. I decided on the stocking from this year's holiday IK. 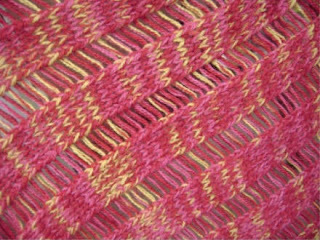 I used Wildfoote sock yarn (double-stranded) in red and white and also a little bit of Knit Picks Essentials in the cranberry color. I used the darker red for the middle few rows of each chart. I didn't do the top row of snowflakes and put her name on it instead. It needs a good blocking but I love, love, love it and am so happy I finished it before Christmas was over! Thanksgiving week was madness! A 600 mile road trip, 2 families, 2 Thanksgiving dinners (thankfully on 2 different nights), tons of family, several baby meltdowns because of an inability to sleep in a strange place and, to top it all off, my husband's high school reunion. Whew, I'm tired all over again just thinking about it. It's taken a while to recover. As nice as it was to see everyone, I'm really happy we're staying home for Christmas. Sidenote: I was unenthusiastic to say the least about going to the reunion. To make it worse, we get to the place in SF and it's right next door to a YARN STORE! Oh, how I wanted to break in and spend a couple hours knitting in my $400 party dress (of course I didn't spend that much- $32 at Nordstrom Rack!!) while Mike talked about the good ol' days with people I didn't know. It wasn't that bad, though , and I even got the compliment of all compliments from a stranger- the coveted "You just had a baby?! You look amazing!" So it was pretty good after all. I did get a fair amount of knitting done. My bpt only needs a zipper sewn in and then I'll show it to you. I did cheat and wear it today with a pretty pin to close it. I will sew in the zipper. I will. In the car, on the way to California, I started knitting the Spiral Scarf from Knitting Nature. I'm using yarn I dyed a year ago and I've wanted to knit this scarf with it ever since I saw the pretty shades of blue and green that appeared. I'm really excited to finally be knitting it! I'm pretty sure there's an error in the pattern, even though it's not on the official errata for the book. I hate that. Each hexagon is 1 stitch smaller than the previous one so there are basically 2 patterns- one for hexagons with an odd number of stitches per side and one for even numbered sides. The problem is for odd numbered sides. 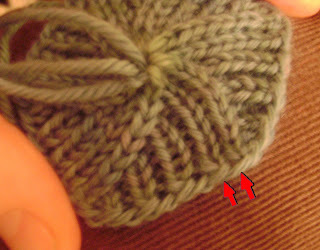 The directions say to knit, purl across, ending with a knit stitch. The problem is that now the next side starts with a knit stitch so there are 2 columns of knit stitches next to each other . It messes up the ribbing and looks bad on the reverse side as well. It doesn't look that way in the photos in the book. So, the next time I started and ended my rows with a purl. Yes, there are two purls stitches in a row, but the last 2 stitches of each side are knit together on every round. This means that after the first row, it's a regular 1x1 rib. Perfect, right? 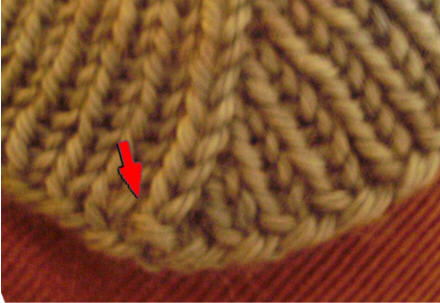 That pesky purl stitch makes an unsightly purl bump in an otherwise pretty column of knit stitches. I just wasn't happy with that. So, I tried again. I still started each side with a purl stitch but I knit the last 2 stitches of each side. On the second row, where the decreases begin, those 2 knits are knit together and everything else falls nicely into place. See? Perfect. By the way, this is the real color of my yarn. Pretty, no? It reminds me of a slightly foggy day at the beach. I love it. You probably haven't even made it to the bottom of this post but one day you just might want to knit this scarf and you'll Google it to see if there's a pattern error or if your hexagons are supposed to turn out differently. You'll find this post and then you'll thank me. I hope. EDIT: I love Ravelry! Nora Gaughan herself replied to me to tell me that I was right and no one had pointed that mistake out to her yet! I'm just excited that she "talked" to me. Check it out, I'm famous! I'm on Craftzine! Check it out here. I feel so special. Craftzine has some great projects. Y'all should take a look. Silly baby loves chewing on the tape measure. She tries to eat my patterns too. Yum, paper. These are the Perfection Pants from Wooly Wonder. 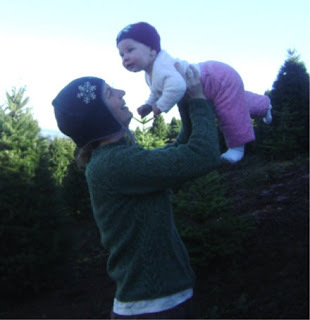 We use cloth diapers so these wool pants (longies in cloth diaper speak) are the waterproof outer layer and they're warm and snuggly soft. I used Knitpicks Merino Style. The light blue is called Tidepool and was left over from my ogee tunic and the dark blue, Frost, was in the stash too. I didn't have enough of the light blue to finish and I didn't want an abrupt change to the dark blue so I opted for a slip stitch pattern to make it pretty! I love slip stitching! I'd never done colorwork like this before and it was so easy. and-the-baby's-cranky kind of holiday. It will be great. Really, it will. Oh yeah, I also get to go to Mike's high school reunion. That I'm not too excited about but I'll survive. 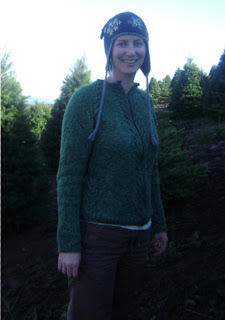 Or: Why it just might be in my best interest to spend all waking hours surfing Ravelry. 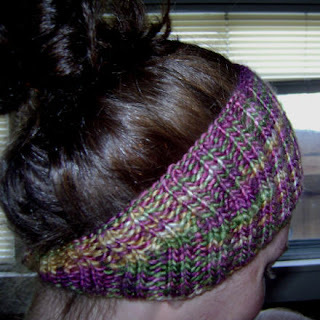 It's getting cold here and I decided to knit a headband since it's hard to wear hats with all of my hair. I picked Calorimetry because it looked easy and cute. It was easy. I knit it in a day and a half, which is pretty impressive since I don't have much time to knit because little sesame demands most of my attention. I then tried it on and it was too big. Not just a little loose but covering-my-whole-head-like-a-giant-knitted-multicolored-toupe too big. Here's where ravelry comes in. I looked the pattern up on there and discovered that out of the thousand or so people who have knitted it, a great majority found that it came out way to big. I hate that! It's one thing to have it be too bog for me but when it's that many people, something is clearly wrong with the pattern. Was she designing for a freakishly large head and didn't tell the rest of us? Silly me though I was spending too much time on Ravelry. Clearly it wasn't enough, though. It had the power to help me make a properly sized Calorimetry the first time around but I didn't take advantage. Lesson? 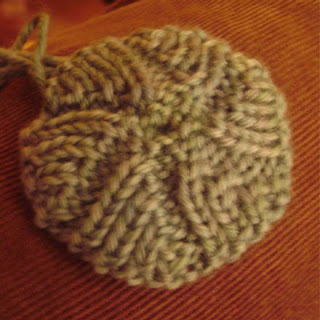 Look stuff up on Ravelry before I knit it! My knitting time is precious and should not be wasted by frogging and reknitting! The pictures are all of the good one (which I knit in only a couple of hours, by the way). I cast on 96 stitches instead of 120 and worked 6 pairs of short rows. It's nearly perfect. The yarn is a mystery. ! got it from a secret pal and I lost the label. All I remember is that it's wool with a little acrylic blended in and it's hand-dyed. Here's something I finished a while ago but can finally show you because it's been gifted. 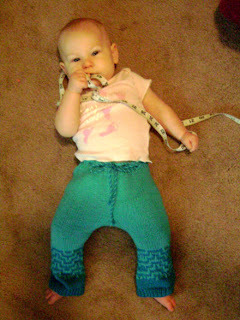 The pants and the silly little baby scarf are knit with Jo Sharp Desert Cotton Aran. The yarn feels nice and is washable so that's good for baby but I don't think I'll use it again. It's made up of what seemed like a million little plies and it got super twisted and kinked up when I was knitting it up. It was really annoying! 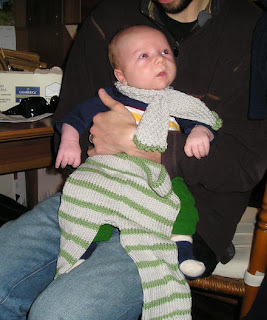 I used this pattern but omitted the cargo pockets. The little guy should grow into them soon. I hope you're all having a great Halloween! 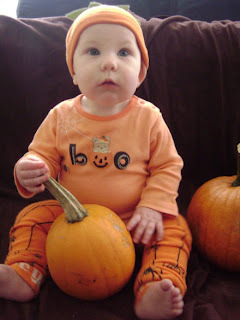 We grew pumpkins this year and were very excited about it but we didn't get a chance to carve any of them! Between having the baby to deal with, I mean take care of, and being out of town last weekend, there just wasn't any time. It's a little sad but sesame is so cute that it's worth it to have her around. I fixed her hat. I went the route of frogging an inch or so, decreased and reknit those rows. Then I turned the hat over and the smaller side is the bottom! It was annoying to have to redo but now it fits. I used Knitpicks Shimmer in the color Happy Dance. It's triple stranded since that's how I knit my clapotis and this was the leftover yarn. 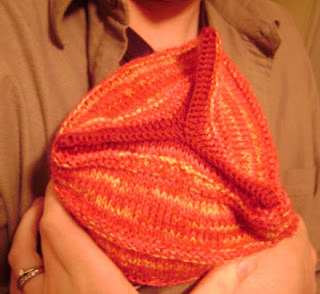 I used size 4 needles and it made a nice, soft fabric for baby's head. 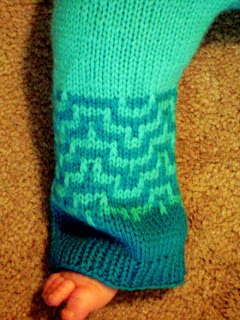 I wanted just a few more rows on the top so I used some sock yarn leftover from my over-the-knee socks. P.S. 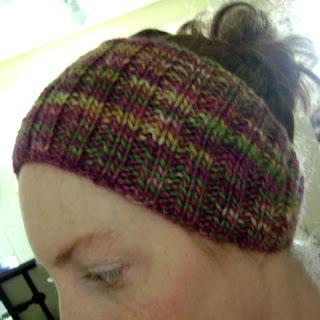 I'm on Ravelry now!! Come visit me! I'm caseyk. Am I the last one on earth? 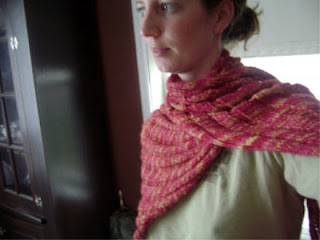 Am I the last person out there who has knit a Clapotis? I did this summer and now I know what all the fuss was about. What a great pattern! 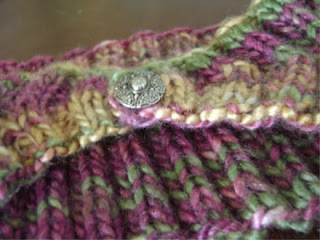 I used Knit Picks Shimmer in the Happy Dance colorway. I triple stranded it and the result is a lovely fabric with a lot of drape. It's thick enough to really keep out the chill but it's light and airy at the same time. I love it! The alpaca and silk is a fabulous combination. I could wear this every day. 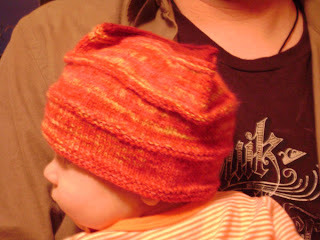 I had a little bit of yarn leftover and I decided to use it to knit the baby a hat. We went to visit my dad this weekend and I knit it while I was there. I was distracted by visiting with all my relatives and, of course, by a crying baby, so I didn't try it on her while it was in progress. Bad decision. It's really cute but a little too big around. 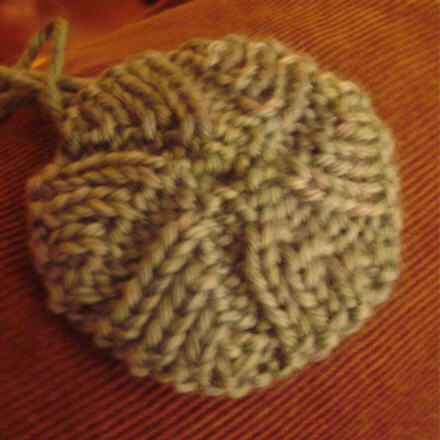 The best thing to do would be frog it and start over but I have so little time to knit nowadays that I don't know if I can do that. 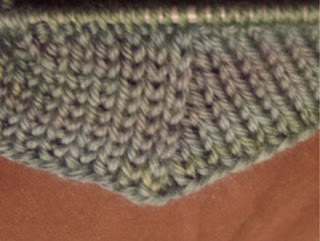 I thought of taking out the top seam and frogging an inch or so, then decreasing for a few rows when I reknit it. That way, I can flip it over and have the narrower "top" be the bottom so it's snug around her head. I can seam the cast on edge to then be the top. Or, I could just leave it alone and knit a chin strap to keep it on her head. What do you think? Here's a picture from our trip. This is the southern CA part of my family. That's my 94 year old grandpa on the right! I'm so happy he got to meet his great granddaughter. My dad is next to my grandpa. 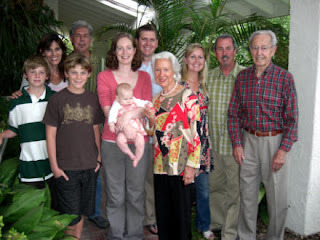 To see more cool photos (some of my fam, but mostly not) visit my cousin's blog. She's an amazing photographer! I'm crafty and my medium of choice is wool. I live as 'green' as possible and I have an etsy shop full of one-of-a-kind creations made from recycled sweaters.